We all have genius. There is a path for us to follow, from our deepest joy, that will provide for us and at which we are BRILLIANT! For each of us, there is something–a job, vocation, role–that sparks our enthusiasm, taps our joy, and connects our consciousness to the vast resources of the Universe. This heady and powerful elixir is what we are meant to experience in life. Our path fuels our Spirit. Our talent for this work/craft/path is different from anything we have known prior. When we endeavor in this “something”, we tap into, and work directly from, our intuition. This is true genius. 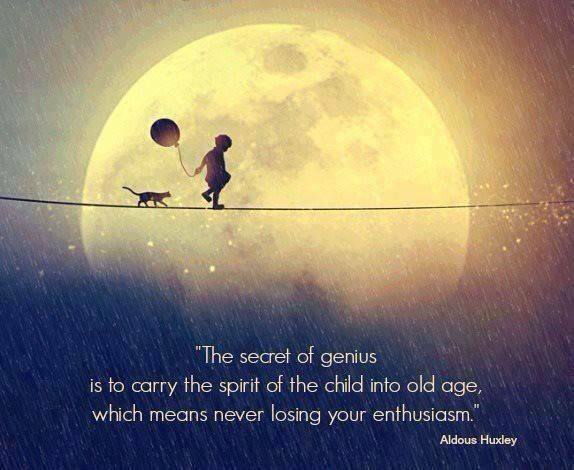 We all carry this genius, the trick is to keep following your joy until you find yours. For some, their genius is already a “job”, like lawyer, journalist, father, or nurse. For others, they may need to use their imagination to determine how to create a job from their joy. For others still, their genius isn’t what they do but how they do it. No matter how your genius manifests, keep looking till you find it. How do you find it? Mindful enthusiasm! Pay attention to what brings you joy and child-like wonder, then follow it, even if it seems improbable or frivolous, our genius is neither.